David McGoldrick scores his side's only goal of the game this evening. 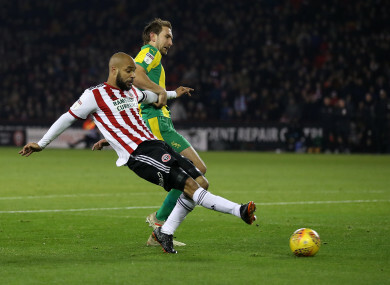 DAVID MCGOLDRICK NOTCHED his sixth goal of the season this evening as Sheffield United took the lead at home to Championship rivals West Brom at Bramall Lane. The 31-year-old Irish striker pounced on a wonderfully weighted pass from Mark Duffy and held off the challenge of Ahmed Hegazy to slot his low finish past Sam Johnstone. Gareth Barry got West Brom back on level terms before the break. The former England international latched onto the end of Harvey Barnes’s low cross and made no mistake from eight yards. Brilliant from Harvey Barnes who squares for Gareth Barry to power home. Former Arsenal defender Kieran Gibbs scored the winner for West Brom in the second half as the visitors moved within four points of Championship leaders, Norwich City. Email “Ireland's David McGoldrick opened the scoring for Sheffield United tonight with this tidy finish”. Feedback on “Ireland's David McGoldrick opened the scoring for Sheffield United tonight with this tidy finish”.